The upgrade master of the name recording which whispered as “the highest peak audience of 1978 visit” is new discovery. It is a permanent preservation press appeared in 2CD. The recording update master holds “January 12, 1978: Hiroshima prefectural gymnasium” performance. Let’s first check the position of the show in the schedule before the record update quality you care about. In 1978, a huge tour of all 16 performances realized in Richie Blackmore’s visit to Japan is realized. This work Hiroshima performance was the 2nd performance show. 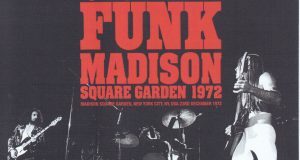 This day has long been known for live albums such as masterpiece “THE SHIP FROM HIROSHIMA” and “HIROSHIMA 1978: FRONT ROW” from old times. This time, the new excavation became the main of “THE SHIP FROM HIROSHIMA”, a name recording which was also distributed as a sound board at the time. What brought me from my own route this time is a young master of generation. That sound is exquisite. As expected, there is only a thing called a sound board, there is no sense of distance, close contact for the first time, the details are super vivid. Despite sucking in enthusiasm of popularity, it is far beyond the sound of heavy drums and thick sounds. It is a superb recording that can only be regarded as a sound board. Moreover, this time the master is overwhelming for upgrade as well. “THE SHIP FROM HIROSHIMA” was also wonderful, but if you compare it with the new master, if His is also big, the bass is weak and the middle treble is quinch and light. It sounded like a balance that only the guitar and vocals strangely drew out. However, the new master of this time is as deep as silent without hiss, as thick as the direct guitar & vocal is intact, thick and thick all the way down to the middle bass. I feel a lot of direct response to a sense of touch. It is too realistic to call it “as if it is an official”, but it is a superb sound that I want to call. However, although everything seems to be too amazing, this recording traditionally had one problem. Actually it is an incomplete recording, and it is also a type that breaks even in the song. Even masterpiece “THE SHIP FROM HIROSHIMA”, I mixed the 2 recordings and formed the body of the live album. 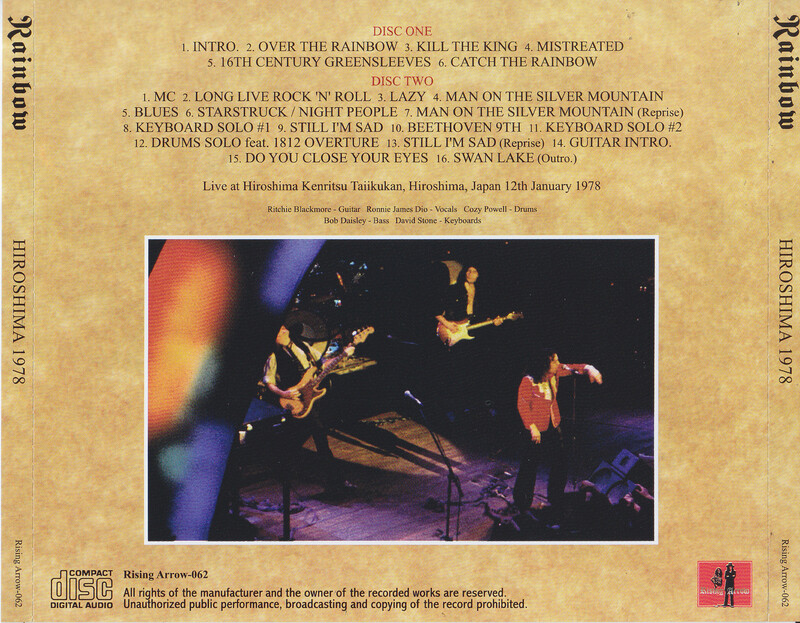 This new discovery master is much longer than the one used in “THE SHIP FROM HIROSHIMA” and you can listen to the first half important songs such as “Over The Rainbow” “Kill The King” “Mistreated” “16th Century Greensleeves” perfectly Then, even in the giant medley, the main part of “Man On The Silver Mountain” “Still I’m Sad” and “Blues” “Beethoven 9th” are perfect. 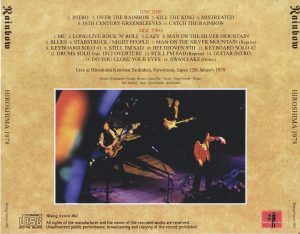 However, other part of the medley and “Catch The Rainbow”, “Long Live Rock ‘n’ Roll” and “Do You Close Your Eyes” had a lack of several seconds to several minutes. 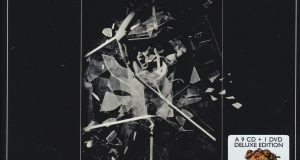 Although the details are omitted, the missing part is complimented by “THE SHIP FROM HIROSHIMA” in this work, but it is complemented with “HIROSHIMA 1978: FRONT ROW” even for the missing part (MC and drum solo) even then. Of course, I applied mastering with the main new master and sound, realized the longest complete recording album ever. To tell the truth, “THE SHIP FROM HIROSHIMA” does not use very fine recordings, so it seems that the whole part was thrown out entirely. However, in this work we make the most of the ultimate master of excavation no matter how short it is. I studied the highest peak sound to the limit. The wonderful thing of the Hiroshima performance which was updated in this way … …. As mentioned above, this day is the second performance. 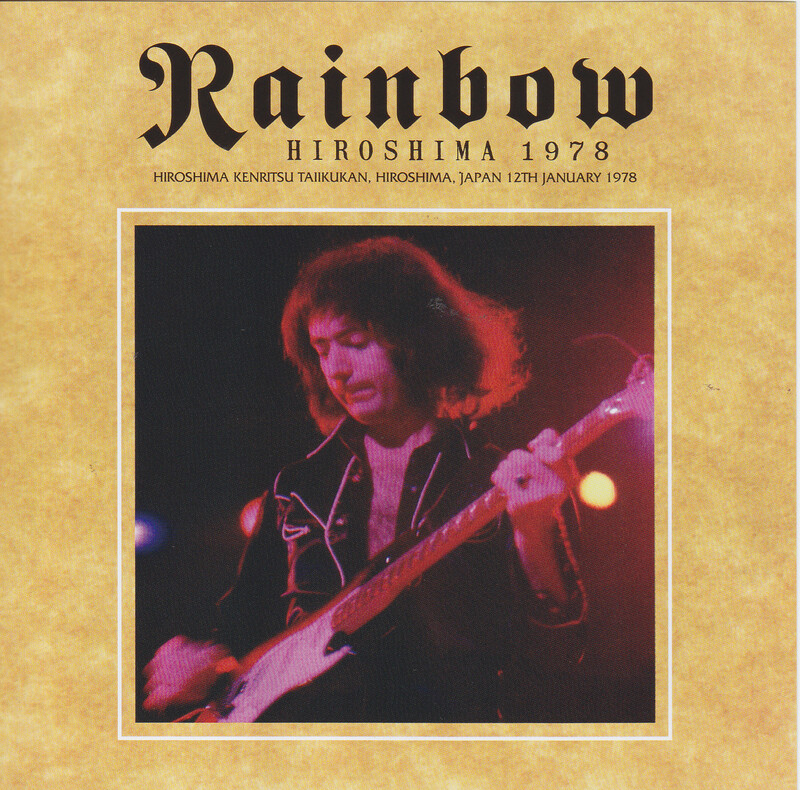 In the first day Nagoya performance “NAGOYA 1978 (Rising Arrow – 060)”, Ronnie’s singing was a live album with a leading role, but the main character of this work is Richie Blackmore himself. In Nagoya I was playing with enthusiasm but it was a feeling that phrases spun by Improvisation have not caught up with the spirit. However, in this Hiroshima performance, there is a flash in the phrase, and a delicious in-pro that will be demonstrated will come out Bang Bang. Furthermore, the whole band turns well as it is pulled by such Ritchie. Ronnie does not show the songs as much as Nagoya, but Cozy is also great. Bob · Daysley and David Stone are also live albums that shine because they are rich sounds. Distributed as a sound board, upgraded name recording which was even called “the highest peak in Japan in 1978”. It is a live album that will be a record update. A new name board of 1978 which realized even the longest seamless recording in the history by making full use of the glow of the new discovery master. 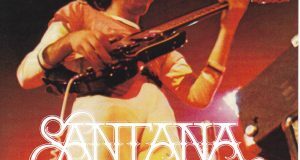 Please witness the birth of this wonderful highest peak live album.